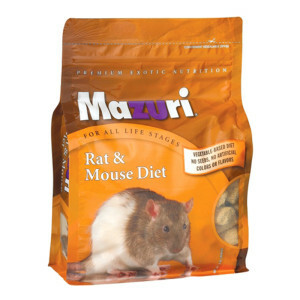 A common store bought food (available at places such as Petsmart) is the Mazuri Rat & Mouse Diet. While not considered a high quality food by many rat enthusiast, it is considered one of the better pet-store chain brands available (which isn’t saying much!). Its protein levels are too high, corn is high on the ingredient list, and it contains alfalfa, which rats have difficulty digesting anyhow. If the food itself wasn’t bad enough, this week I received an email regarding a voluntary recall of certain Mazuri products. 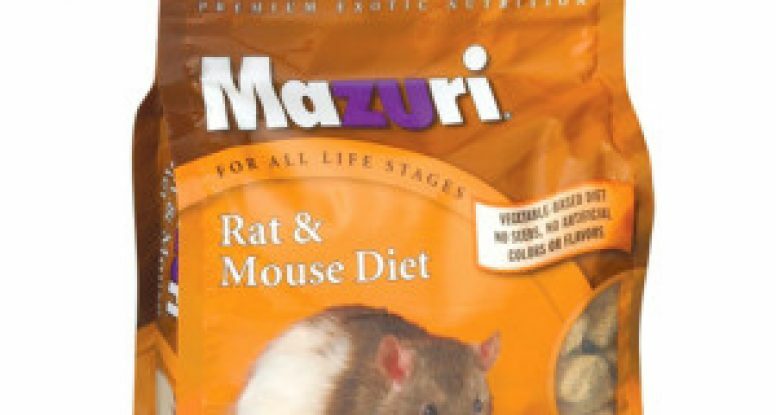 While the Mazuri Rat & Mouse Diet was not listed specifically, some other rat owners said that they are able to purchase Mazuri out of a bin by the pound, and I am very leery about buying anything for my pets from a bin where I do not know the important information such as lot codes in the event of a recall. One rat owner I know had six of his mice die without known cause and he was a bulk buyer, so it could be that his supplier stocks their bins with one of the noted recalled foods. Also, keep in mind that this recall is due to potentially lethal Vitamin D levels- Vitamin D3 poisoning is a method used to exterminate rats as it kills slowly. I would be afraid that because it kills slowly, that many rats would be dying because of this food, without anyone knowing about it until its too late. I also noticed that there are several guinea pig diets listed and as a proud piggy owner, I am avoiding this brand altogether…its just too risky. And from many deceased or ill pet owners I have seen on Facebook, apparently Mazuri testing to ensure the safety of its products is shady. FOR IMMEDIATE RELEASE -July 13, 2012 – PMI Nutrition International is initiating a voluntary recall of certain varieties of the AquaMax™ feed products with specific lot codes listed below, due to the potential for elevated vitamin D levels. Although no customer complaints have been received to date, the products are being recalled due to analytical test results that indicate a potential for elevated levels of vitamin D.
The company is also expanding its previously announced voluntary recalls to include additional varieties of the Mazuri® and LabDiet® feed products with specific lot codes listed below due to analytical test results on additional lots of retained samples that indicate a potential for elevated levels of vitamin D. Elevated vitamin D levels may cause death, or otherwise be harmful to animals and fish if fed for extended periods potentially resulting in lack of interest in eating, weight loss and possible joint stiffness. These products are being added to those from earlier recalls announced on July 3, 2012 and July 6, 2012* which were initiated after receiving a small number of customer complaints which involved animal illness and small bird and guinea pig mortality. All products included in these recalls were manufactured at the Richmond, IN feed plant and were distributed nationwide and to Canada, Puerto Rico, Guam, Bahamas, Cayman Islands, Curaçao, Mexico, Cambodia, Japan, China, Taiwan, South Korea, Singapore, Chile, and the United Kingdom, starting April 2, 2012 through May 8, 2012. Dealers have been contacted and asked to hold these products and to notify and retrieve the product from customers. The affected product should not be used, and where applicable, be returned to the retail dealer. For a complete list of products affected by this recall please click here.